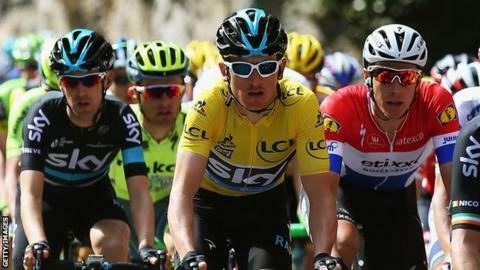 Team Sky's Geraint Thomas returns to action for the first time since withdrawing from the Volta a Catalunya in Sunday's Tour of Flanders. The 29-year-old Welshman won the Paris-Nice stage race in early March, but struggled with fatigue in Spain. Thomas was favourite going into the 2015 Tour of Flanders, but has had a low-key build up this time. "There's less expectation around me [but] we've got a super strong team," Thomas told BBC Radio Wales. "We've got lots of cards to play so as long as one of us is on the top step on the podium that would be awesome." Team Sky have never won one of cycling's big five annual one-day races - known as "The Monuments" - and Fabian Cancellara of Leopard Trek is the fancied rider this year. Thomas believes he has benefitted from resting after his withdrawal in Catalunya. The double Olympic gold-medallist also thinks his team are closer to claiming victory after disappointments in previous years. "It's all good now, I'm feeling healthy," he added. "I had maybe four days off because I was run down after Paris-Nice, but I'm better now so it was a good call in the end. "In previous years in some of the warm-up races I've been right there, but this is the big one everyone wants to do well in. "And over the years for one reason or another it hasn't quite happened but hopefully this can be the year. I guess time will tell."